Nepal Needs Volunteers… Don’t Just Take A Vacation; Help Us Help Nepal with this amazing volunteer experience. You do not need to be a teacher to go on this trek. We are looking for volunteers who love working with children, are interested in cultural immersion, and going well off the tourist path of Nepal. The overall goal of this trek is to not only ensure that children in remote villages of Nepal are getting the supplies that they need to foster learning, but also to ensure that their teachers stay connected with other educators and facilitators. By helping the children AND the teachers in these villages, we foster growth and sustainability. Deliver new school shirts for village children. Having the same clothes of the same quality promotes equality. This is important for children in the Dalit castes, and others who are marginalized. Help village teachers practice English fluency and latest technology. Join us for Teaching Trek Nepal. We need volunteers who are fluent in English to help us bring supplies to the schools and improve literacy in these villages. People in the west are constantly in touch with technology, and through this they are learning and advancing at a lightening speed rate. However, in remote areas of Nepal where education tools are scarce, it is hard for the schools and the children to keep up. It starts a cycle where lack of education leads to lack of education. The more educated, highly fluent teachers often leave remote communities to find a better life in Kathmandu, or out of the country. 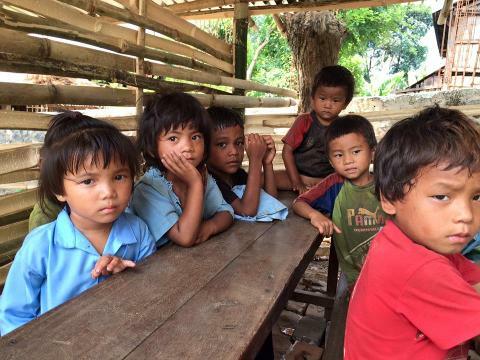 The remote village schools do their best, but their facilities, supplies, and educational materials are limited and dated. On this 14 day itinerary, after your orientation days in Kathmandu, you will head out to a remote region of Nepal (well off the beaten tourist paths) to villages where people do not have the tools or supplied to teach and give children education. 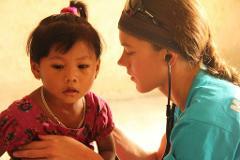 You and your fellow volunteers will spend 10 days trekking and setting up camps to serve these villagers. Your trekking fees help pay for school supplies, teaching tools and clothing to children in the villages you visit. You will be going with Nepali translators and guides, along with a cook and porters who will help you enjoy this camping trek to places in Nepal that most tourists never see. 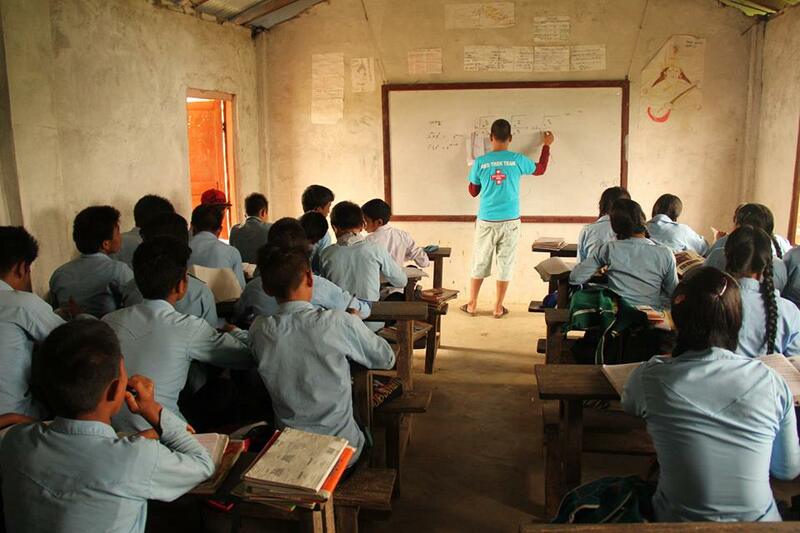 Our Nepali guides will help you communicate with the villagers and assess their educational needs. We see many children on this trek… They love our volunteers and our grateful for your presence in their village. Teaching Trek Nepal helps around 1000 people on each trek. Once you arrive in Nepal, you are picked up by our Kathmandu based team, and transported to the hotel we use for each trek. The Nepal team takes care of everything you need for 14 days including ground transportation, most meals, and securing permits required for medical volunteering. On trek, your porters and sidar provide for all your camping needs. You will be accompanied by an expert Nepali trekking guide. Education Experience: You will also learn about Nepal lifestyle through this cultural immersion experience. Find out why Nepali people are some of the world’s strongest, most agile climbers and athletes. In these life changing 14 days, you will learn a different sense of time, and how less ticking of time is healthier. You will likely have a new outlook on life, and the way you approach education.